Ever since I knew what growing up meant, I wanted to be a writer. I even was voted most likely to be published in my 8th grade class. Before that, I wanted to be an explorer. Partially because that’s what my sister wanted to be and I wanted to be my sister, but also because I have always had an inexplicable urge to see the world. But in my childhood, my view of the world was a little different. Imagine Skyrim, the video game, fused with Indiana Jones. I used to wander the streets around my infinitely suburban neighborhood, pretending my bike was a horse and peddling into caves and caverns and sunsets. When I found out being an explorer wasn’t a real career (and archaeology wasn’t all that and a bag of chips), I tried to discover what the next best thing would be. That’s when I found books. I used to hate reading. The main reason was because I was, and still am to be honest, terrible at reading out loud. During school when I was called on to read, I stumbled and butchered all kinds of beautiful words and stories because I couldn’t make my mouth form the words as fast as my brain was reading them. No one made fun of me directly, but I could hear the silent collective sigh of classmates when a teacher called my name to read. And the whole time I was reading, they were shuffling around in their seats in, what I assumed to be, annoyance. I wasn’t good at reading, so I hated it. What changed me also changed a lot of the world. The Harry Potter series. My older sister read them, and I plucked the first one off of her shelf wondering what all the fuss was about. This story is much like other stories of my generation. Once I started reading, I didn’t stop. I would stay up entirely too late with a flashlight under my covers, reading and reading and reading until I fell asleep. I read during recesses at school. My favorite time of the day at school was free reading. I became a bookworm. And it wasn’t a phase. As almost all bookworms do, I think, I began to want to write. I had a notebook I would carry around with me at school. I called it a novel, but it was really just me writing a fan fiction story almost parallel to the Pendragon series. It wasn’t very good, but I loved writing it. I dabbled in angsty poetry in high school, I loved writing essays for school. I loved writing, but didn’t believe I could make anything out of it. I had ideas, but they were too strange. Kind of dark and I wasn’t sure there was any place for them but inside my head and in my journal. No authors ever really came close to my admiration for J.K. Rowling. I didn’t think any authors ever could. But one day, a friend of mine and I were in a bookstore. Seeing someone we had met in high school, we walked over to the science fiction section where he was standing and chatted. “What are you looking for?” I asked him so I could help. “Anything by Neil Gaiman,” he said picking up a novel with a graphic castle depicted on the front. “The most amazing author I’ve ever read,” he said, pushed the book with the castle on it back into the shelves and went to ask the bookkeeper where his novels are located. And go from there I did. I became obsessed, and still am. Neil Gaiman is my favorite author of all time. I absolutely recommend American Gods, then Anansi Boys, then Smoke and Mirrors, then Neverwhere, then Fragile Things, then The Graveyard Book, then ALL THE THINGS. He is amazing. That’s the end of my plug, just go read him. Neil Gaiman was the one who made my drive to write soar. He wrote about things I wanted to write about, weird worlds and intriguing characters and mythical creatures and dark themes. I know many other books have these details, but for some reason Neil awakened the feeling in me that I could do this somehow, too. I found out he was doing a book tour for his newest book Ocean at the End of the Lane in July of 2013, and I was determined to meet him. I drove four hours to Ann Arbor, Michigan to meet him with two friends. He was late because there was a plane crash in California, and the airport was on lockdown, but he assured us on Twitter he was coming and he was sorry. We all tweeted him, telling him we didn’t care and to stay safe. While waiting, I wrote him a note on some scrap paper I found, trying to tell him how much I loved him and how much he meant to me as an aspiring writer who didn’t think I could do it until I read his work. Of course the words fell short, but I tried. When he came and talked and read some words out of his book, I felt like I was in a dream. Neil is a storyteller, that’s just what he does and it is magical. 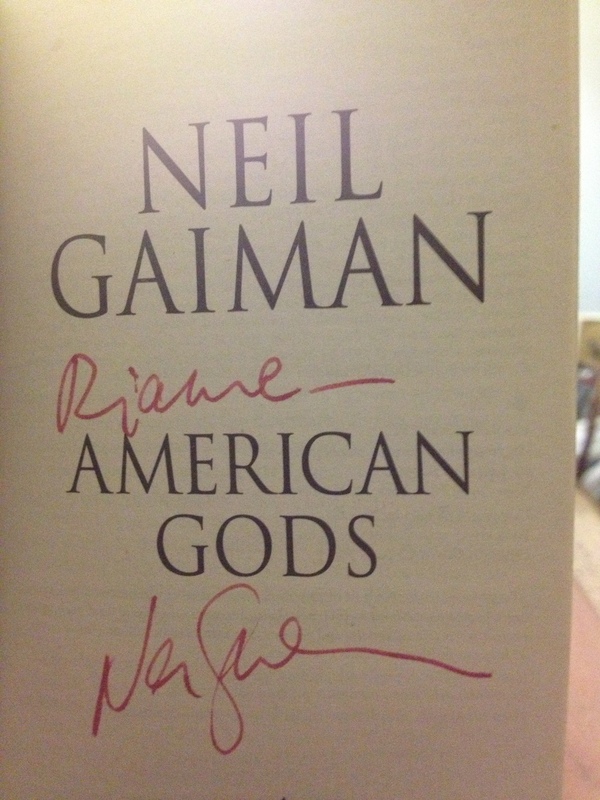 After speaking, Neil went out into the lobby to sign some books. His agents or crew or people tried to convince him that it would be too late to sign two books for everyone, just sign one. But he wouldn’t. He signed two books for everyone, stood up for pictures when asked very nicely, and smiled. I waited for four hours, I think. When I finally got up to his table, I clutched my copy of American Gods, Ocean at the End of the Lane, and my crinkled note to my chest. A lady asked for the books, and I handed them over. She asked me my name, and she wrote it down on a piece of paper so he would be sure to spell it right. When I got in front of him, he made eye contact with me and said hello and tried to pronounce my name. I kind of froze, smiled and said hi. As he was signing my books I said, “I know we don’t have time to talk, so I wrote this for you,” holding out the piece of paper in a shaking hand. He smiled at me, his crew around him made an audible “awww” noise which made me uncomfortable. He did not break eye contact and he said, “I’m going to put this in my pocket and I will read it later. This is one of my favorite things to do after a tour, is read all the notes I get.” He put it in his suit jacket, and I was carried away by the mass of people waiting to meet him behind me. He kept looking at me with a tired, but genuine, smile as I was being pushed towards the end of the table. With a little wave, Neil turned to the next fan in front of him. One of his crew handed me my books back. I immediately turned away from Neil (hopefully in time), clutched the books back against my chest, and cried. I can’t explain why. But I cried and cried and cried. That moment was magic. That moment makes me want to be the absolute best writer I can be. That moment makes me want to write from my soul and never stop. And it makes me believe I can. Because for some reason, I felt that Neil Gaiman, in that minute of talking to me, believed in me too. And I know it is stupid and crazy, but it is what gives me courage. So I’ll keep believing it. 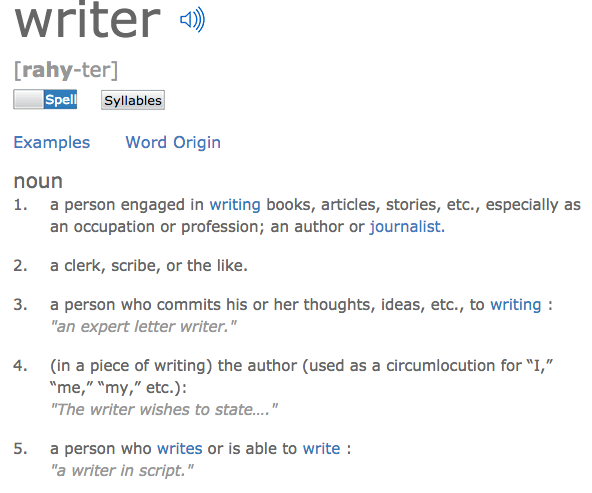 Post Script- Click here to read Neil Gaiman’s epic answer to how to become a writer.